Do you need help with moving through a difficult period of your personal ascension? Are you integrating a soul aspect? Looking for shamanic soul retrieval? Yvonne Perry’s self-evolved treatment model is designed to help clear stuck energy, detrimental thoughts, emotional patterns, and any blockages that are preventing you from living your most authentic life. This activation is forward-moving to help you gently and quickly move into joyful expression of your authentic self. While on Skype or the phone, you will receive light language treatment after a brief chat to set your intention for the session. This aligning of inter-dimensional frequencies of multiple soul aspects can be done in a passive manner during which you simply relax and allow the work to be done. Or, you may remain alert and interactive as you engage in conversation and participate as a partner in the treatment. 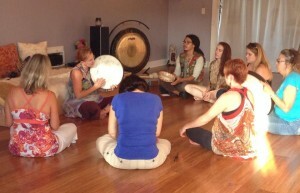 Using sound and light frequencies (drumming, chanting, intoning, and light language) Yvonne travels trans-dimensionally to release souls, heal past life trauma, and bring soul fragments home for integration and healing. This shamanic journey is especially helpful to walk-ins, but can benefit anyone who is ready to take a quantum leap on the ascension path. Yvonne works with your monad (high self), guardians, technicians, ancestors, and guidance team to insure that you receive what you are ready to integrate—nothing more and nothing less. Yvonne’s focus is on the body grids and templates to help resolve emotional/mental patterns in the cellular memory, and to open or “switch on” light codes in the DNA. Her galactic team “re-scripts” Akashic records to remove imprints of trauma. This adjustment helps clear, repair, and soothe subtle bodies and balance/align chakras as it activates and connects them to the crystalline grid, which helps the whole person (body, mind, emotions, spirit) acclimate to the changes resulting from rapid ascension. Meet in person with practitioner Yvonne Perry for a trans-dimensional light language activation and energy session in the Nashville, Tennessee area. This is the same method of shamanic journeying and healing treatment as the remote light language activation session she offers, but you will receive the private session in person. Typical results include clearing detrimental energy or blockages, repairing subtle bodies, opening and balancing chakras, accessing emotional healing, uniting body and spirit, activating twin ray energy, and supplying energy to help shift bothersome situations. If a walk-in is in progress, Yvonne can assist with clearing the energy of the walk-out soul and helping the body adjust to the new frequencies of the incoming cosmic soul. Yvonne and her galactic team “re-scripts” Akashic records to remove the imprints of past life trauma. As multidimensional beings and individuations of the Divine Cosmic Intelligence, our souls have multiple counterparts or aspects residing in dimensions besides this Earth plane. There is no limit to how many individual parts make up the whole of creation. Any of these soul parts can influence or assist us in our life on Earth. An embodied soul can fragment (divide and scatter) during severe trauma or if intense emotional overload occurs. An aspect of our personality may “flee the scene” or dissociate during the ordeal and go into hiding until it feels safe to return. This aspect may go into protector mode and pop up as self-sabotage anytime we experience a similar or disturbing event. The soul fragments can be recalled, cleared of karmic imprints, and reunited with the embodied soul through a practice known as soul retrieval. Yvonne Perry has successfully facilitated shamanic soul retrievals for many of her clients. This service can be requested as the focus of your session, but many times it is part of the whole-ing process of a typical session. If you are temporarily unable to pay full price for a session, please use the sacred economics system. If you are able to pay more than the requested fee and would like to help someone obtain healing, you may make a donation.